From our hearts to yours: the Orange Country Chapter of the Romance Writers of America showcases 19 tales to touch the hearts of readers. Romancing the Pages is available in digital and print media. The anthology offers a little something for historical readers with the lush “Purple Orchids” as well as a modern meet-up in “The Guy with the Dragon Tattoo;” a horror romance, “The Carnival,” where marriage proves to be more than everlasting; and “The Meat of Romance,” a paranormal twist on an age-old battle reminiscent of futuristic Romeo & Juliet. 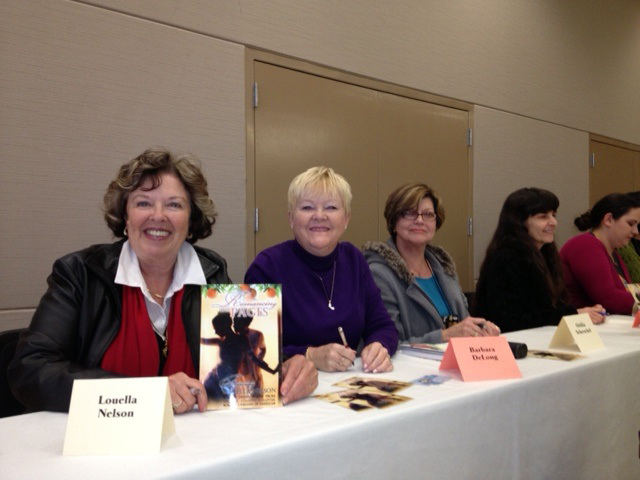 Lou signs at the RWA launch of the print version of Romancing the Pages.